Spread the mustard over the inside of the bread. Layer the bottom half with the cheese, turkey and ham. Arrange the pickles on top. Cover with the top and cut in half into 2 sandwiches. Heat a large skillet over medium heat and spray with Pam. Add the sandwiches and place a heavy skillet on top, pressing down to flatten them. Cook 3 minutes, remove the top skillet, and turn the sandwiches over. Press down again with the skillet. Cook until the cheese melts and the sandwiches are heated through, 4-5 minutes. Cut each sandwich in half crosswise before serving. Personal Review: A while ago I went to the library in search of cookbooks. I came home with 5, three of which were Weight Watchers books. I’ve been on a quest to make “healthier” options, but I don’t want to have to give up too much in this quest. In other words, I want to be 18 again and be able to eat what I want when I wanted to. Alas, I am no longer at that point in my life, and while I do go to the gym on a regular basis, I need to start watching what I eat a little closer. Thus the Weight Watchers cookbooks. I actually did weight watchers my sophomore year in college (yeah, the “Freshman 15” was closer to the “Freshman 30” for me) and had incredible results. So I figured if I went back to the recipes, I should be in a little better shape. This recipe immediately caught my eye. We actually go to a restaurant in Florida, Columbia’s, that is known for their awesome salad. 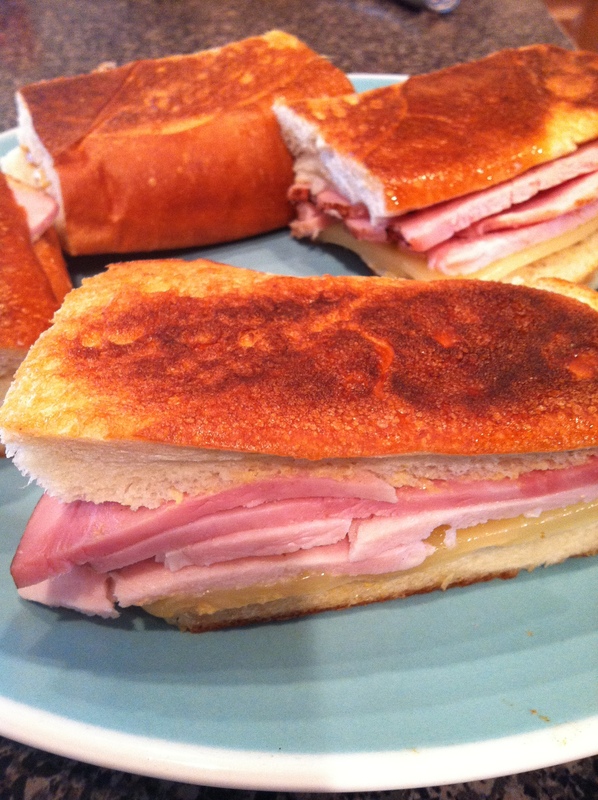 But they also have an amazing cuban sandwich. Knowing that my husband loves that sandwich, I figured it would be a good recipe to try. First, I used a griddle just to make it easier to place a heavy skillet on top of the sandwiches to flatten. I also used dijon mustard (why? well because I had bought it for a different recipe and then used it in this recipe unintentionally, but it didn’t hurt anything). And I didn’t use “deli” cheese or meats … I bought thicker cut ham and turkey lunch meat. And since I am not very fond of pickles in general, I had Nathan add his to the sandwich at the table. Overall, I really enjoyed this recipe. It’s simple and quick. I probably should have cooked them a little bit longer just because I didn’t get them completely heated through. But it’s definitely a keeper recipe that passed the test in our household.